Whether you’re an introvert or an extrovert – whether your idea of a good time is going to a huge party or brewing tea and reading Astonishing X-Men in your room (clearly the correct answer because Whedon wrote it) – you need to know how to build and maintain relationships with people. If you’re in that introvert camp, though, meeting new people and “networking” can be anxiety-inducing. Other things seem like straightforward, step-by-step affairs. Mastering the coursework in your major is easy. Crafting a resume is simple. But how do you “network” when you can’t even make small talk? Actually, building relationships and networking can be broken down into systems and processes as well. Moreover, networking is a skill that can be learned with practice. And if nerdy online bloggers can do it, so can you. Enter my friend Stefano Ganddini. I met Stefano a couple of years ago when he started reading College Info Geek and eventually reached out to me. Since then, we’ve chatted, shared each other’s work, and I eventually talked to him on the podcast. More recently, he met up with me at VidCon, and we both spent a day hanging out and building relationships with a bunch of cool people who make great things on YouTube (and Stefano doesn’t even make YouTube videos yet). In this guest post, Stefano goes over how he did all these things, and shows you how you can become great at building relationships even if you’re an introvert. I’ll be honest – I was really impressed with this guest post, which is why I wrote a longer intro for it. I think you’ll get a lot out of it. Check the end of the post; he’s put together some additional tips in a cheat sheet to go along with it. A couple of months ago I was talking to a friend of mine–a computer science major–about networking (the kind that involves people, not computers). It caught me off guard and I didn’t really know how to respond. I’ve always assumed that everyone wants to improve their networking skills. It wasn’t until my friend asked this question that I realized that many people don’t want to improve this skill. I think this is due to an incomplete understanding of what it means to network. After having put a lot of thought into the topic and looking at how networking has personally benefited me over the last few years, I am confident in saying that there are several advantages to networking, even if, in the end, it doesn’t get you a job. In this post, I’ll explain the true value of networking and then show you exactly how I managed to improve my networking skills, despite being an introvert. I’ll show you how you can get the most out of career fairs, make great first impressions, find mentors, and build relationships with people that will help you succeed. And at the end, I’ll show you exactly how to set up a system that will allow you to apply all of the knowledge from this article into your own life. Because there is a lot of information in here, I’ve included a table of contents below so that you can come back to this post whenever you need it and easily pick up wherever you left off. 1. The probability of finding the job you want increases as you strengthen and grow your network. Yes, you can survive without networking, but doing so will drastically decrease your probability of getting where you want to go. Think about it like this–the biggest companies in the world (Google, Facebook, Amazon, etc.) never have a problem hiring good employees because these companies have the biggest reputation (or network). Small companies, on the other hand, often have a much more difficult time hiring good employees (though, that’s not to say that it’s impossible) because they have a much smaller reputation (smaller network). The same concept applies to you, but on the opposite end of the stick. Which company would you rather be? The company that has to hire the only person who applied (regardless of how qualified that person is), or the company that gets to pick the best person from millions of applications? 2. Talent alone can only get you so far. Your ability to communicate technical matters to non-technical people, and your ability to communicate technical matters to technical people, will determine how far you can go in your career. Networking (whether in formal settings or informal settings, in public forums or one-on-one) is one of the best ways to improve your communication skills. I mean, what better way to improve your ability to talk to people than by talking to people? 3. Networking increases your web of knowledge. Anything you need to do, you can either do it yourself, or you can find someone to do it for you. You’ll never be able to learn all of human knowledge or master every skill. You won’t even be able to get to most of them. But, with a little networking, all of a sudden you have access to an exponentially larger set of knowledge and talents. You also become a connector. Say the company you work for is hiring, and you know a friend who would be perfect for the job. Because of your referral, your friend gets a job and the company gets an employee. You’ve added value to both parties, and, in doing so, you’ve increased your own value (and will likely have the favor returned to you, in one way or another). It’s a win-win-win. I used to cringe when I heard this saying. It reminded me of every fake douchebag I had ever met in my life—you know, those people who seem super nice and friendly to everyone they meet, but you can tell that deep down they just want something from you. Because of these people, I used to justify my anti-social behavior by saying that I didn’t want to become one of those “douchebags” and start changing the way I talk. I had a bias against socially adept people which prevented me from making an effort to improve my social skills. This psychological barrier took me years to overcome. Why should I have to change? I thought people should like me for who I was. What I eventually came to realize, however, is that no one will ever like you if they never get to know you… and no one will ever want to get to know you if you never show any interest in wanting to get to know them. I’ve realized that being social is less about you and more about others. And the same applies to networking. It’s not about telling people how great and smart you are, it’s about exhibiting a genuine interest in others and seeking ways to help them, without expecting to receive anything in return. As my social skills have improved over the years, my views about networking have changed as well. I’m still not the most social person in the world, but my personal experiences have demonstrated the value in networking and maintaining relationships with the people in my network. I would never go so far as to say that all that matters is who you know, because that’s extreme and it’s just not true. But, I do believe that everyone should seek to improve their networking abilities—especially those people who may not recognize the value of the skill in the first place. As with with any other skill, improvement requires practice, and with practice, you’re bound to make mistakes. That’s part of the process. But, I want to share with you some of the mistakes that I made so that hopefully you can avoid them. I used to think networking only happened when you were wearing a suit, eating hors d’oeuvres and drinking iced tea. I went to a bunch of these kinds of formal networking events when I was a freshman, but I always left feeling like I had wasted my time. I never knew what to say and I could tell that everyone was just trying to impress everyone. It felt so disingenuous, and I didn’t think I had the personality for it. You don’t have to go to “networking” events to network. Networking happens everywhere. Today, I’m much more comfortable networking at formal networking events, but only because I improved my networking skills in informal settings first. It’s the age-old question: How am I supposed to get a job if I’ve never had one before? When I was a freshman, I thought I didn’t have any experience worthy of a resume. I was wrong. You’re probably more qualified than you think. Don’t worry about not having all the technical skills, you can learn those on the job. What’s more important is focusing on how your past experiences demonstrate characteristics that can’t be learned on the job–things like leadership, resourcefulness, communication, problem solving, etc. When I came to college, I was determined to take advantage of everything that college had to offer, so I went to the involvement fair and joined a bunch of different clubs and student orgs. But, but by the time my first semester ended, I realized that I hadn’t really built any relationships, despite being involved in so many things. This is because a) I was involved in too many clubs, many of which I had no genuine interest in, and b) I showed up to meetings and events, but I never said a word to anyone. Instead of joining a million different clubs, pick a few you’re genuinely interested. Be active, participate, and make an effort to get to know the members outside of the club’s events. Whether you like it or not, the fact remains: people with amazing social skills are more successful than those without. It amazes me that, while social skills might be one of the most valuable skills one can possibly have, we rarely look at it as a learnable skill that can be systematically improved. After all, it is a skill, and just like any other skill, it can be improved—all it takes is some practice. I used to be extremely shy in high school. I was the quiet kid who always sat in the back of the classroom and never talked much. I had a small group of close friends that I enjoyed hanging out with, but I hated meeting new people. I was a terrible conversationalist and couldn’t talk to girls for the life of me. Things are a little bit different now. When I started college, I joined a fraternity, worked at a calling center for a year, and even took an improv class one semester. Because of these experiences, I’m way more confident and social than I used to be in high school. But, I’m still an introvert. It’s a common misconception that introverts can’t be social. Sociability actually has little to do with personality. Sociability is a behavior, which means that it’s learned, not genetically ingrained in your DNA. Anyone who thinks that introverts can’t be social is misguided. It’s true that you can’t change your personality, but you can change the way you think and the way you act—even if it’s at odds with your genetically given traits. “Imagine that lights in your flat suddenly go off and you are in complete darkness. You may be able to navigate your way to the door, but what senses are you going to use? Touch? Hearing? Smell? It would be anything but vision, your preferred sense. However, as soon as the lights come back on, you will switch back to using vision again as it makes it much easier to navigate around the flat.” (Taken from 16personalities.com). This is how people are able to develop traits that differ, or even directly contradict, their personality type—by changing their environment. You can’t wait for change. You have to put yourself in an environment that forces you to change. The fraternity, call center, and improv classroom were all different environments that forced me to behave in different ways than I was used to. Even though they were initially outside of my comfort zone, eventually I adapted the environment. It’s okay if it feels awkward and unnatural at first. Sometimes you just have to fake it ’till you make it. 2. Practice when the stakes are low. If you’re not quite ready to start working at a calling center, you can start off by practicing when the stakes are low. These are the perfect situations to pretend to be the most confident, outgoing person you can possibly be. For example, practice by striking up conversations with cashiers or waiters. Ask them how their day is going. Give them a sincere compliment. Whatever. It doesn’t have to be a long conversation, the point is just to get you comfortable with saying something. Eventually, this confidence will carry over into the rest of your life. 3. Use the 3-second rule. When it comes to meeting new people, one of the biggest obstacles for most people is simply building up the courage to approach a stranger and start a conversation. The 3-second rule happens to be the most powerful pickup tool a guy or girl could have, but it’s also a great tool for meeting new people in any context. The rule requires that if you see someone you’re interested in talking to, you have three seconds to walk up and start a conversation. It’s very simple, but extremely effective. It’s so effective is because if you wait any longer than 3 seconds, you’ll probably end up over-thinking it and never saying anything at all. With only three seconds, you don’t have enough time to let anxiety get the best of you. I used this rule when I took on a 30 day challenge during my sophomore year to talk to someone new every day. Although I only managed to talk to someone new for 18 out of the 30 days, I didn’t consider it a complete failure because, in those 18 days, I met more people than I had the entire semester. And, ever since I took that challenge, I’ve never had a problem approaching strangers. Research has found that we make snap judgments of people within the first seven seconds of meeting them, after which point our opinion of them will most likely never change. That’s why it’s so important to know how to make a great first impression. But, how do you do it without feeling fake? When you put your best foot forward, you’re not being fake, you’re showing people who you really are (even if you’re normally less open about it). If you don’t learn how to make good first impressions, you’ll always be fighting a losing battle. 1. Remember people’s names the first time. Anytime you meet someone new, say their name back to them when they introduce themselves and then repeat the name in your head until you are sure you have it. Try making up a rhyme/alliteration about their name or making some sort of mental association that incorporates a distinguishing physical feature. For example, if you meet someone named Bob who is bald, you can remember him as bald Bob (I don’t think he’d appreciate the nickname, so use this only as a memory technique). Or, if you meet someone named Olivia and you notice that she has a big nose, you might imagine that she has olives stuffed in her nostrils. The more absurd the image, the easier it will be to remember. Maintain constant eye contact when you’re talking to someone. An easy way to improve eye contact is to make a point of noticing the eye color of everyone you meet. 3. Pay attention to your body language. Do not attempt at home. Can cause serious back injury. Standing straight with your shoulders back conveys confidence and competence, whereas slouching conveys the opposite. Slow movements show composure and make others feel more calm and at ease, whereas quick, jerky movements make people nervous and uneasy. Hand gestures and facial expressions show that you are enthusiastic about what you’re saying. If you’re not comfortable doing these things, try practicing in front of a mirror. Change the pace of your speech. Extend the ends of certain words for emphasis. Pause every now and then to collect your thoughts. Also, make sure that you don’t mumble. Mumbling connotes a lack of confidence. If people often ask you to repeat yourself, take it as a cue that you need to work on your enunciation. Looks aren’t everything, but they do matter. This has nothing to do with your physical attractiveness; it’s simply about looking well put-together. Wear clothes that fit you well, clip your nails, and take care of your skin and hair. Paying attention to these small things will make you more attractive. Actually listen to what people have to say. If you approach people with a genuine interest in learning about who they are, they will instantly pick up on this and usually return the interest. When you are interested, they become interested. Try to not only understand what the speaker is saying, but what they’re feeling. A big part of this comes from being able to read their nonverbal cues. You’ll notice that as you become more aware of your own nonverbal cues, you’ll also start to become more aware of others’. Most of us don’t do it enough. Not only does it make you appear friendlier and more approachable, but it also is proven to make you happier. Small talk used to be one of my biggest pet peeves. I used to think it was stupid to waste time talking about meaningless things. I always wanted to skip the small talk, and just get to the point. But, once I started making a conscious effort to improve my social skills, I started to realize that if you want to become a more sociable person, and build more relationships in your life, you have to learn how to make small talk. There’s no way around it. You have to play the game. And yes, it is a game, but that doesn’t mean it’s bad. Think about it this way– you can’t just go to a restaurant, sit down, immediately have your food brought out to you, eat, and then leave. At the end of the day, we may think that we want everything to be direct and to the point, but the reality is that we find comfort in these little rituals. At the end of the day, we enjoy the process. The next time you’re having small talk, enjoy it just like you would enjoy a fine dining experience. Either way, whether you like or not, you’ll have to do it every where you go. So, you can either resist it and be the awkward person that doesn’t know how play the game, or you can embrace it and enjoy it. It really isn’t that hard, it just takes some practice. But, it’s actually kind of fun once you get the hang of it. Last summer, I interned at a large global consulting firm and each intern was formally assigned a “peer advisor”—a recent new hire who’d teach us the in’s and out’s of working at the company. While most of the other interns barely talked to their peer advisors, I made a conscious effort to build a strong relationship with mine. I asked him questions almost every day, about how to work more effectively on projects, how to get put on the projects I wanted, and how to differentiate myself from the other interns. Towards the end of my internship, I was the one intern (out of 147 interns in the nation) invited to attend conferences in Las Vegas with some of the top managers and directors of the company. I was flown out to Vegas for a week to attend workshops, network, and eat really fancy dinners at really, really nice restaurants—all expenses paid. It was freaking awesome. My peer advisor also happened to be working on a project in Vegas at the time. Now, I’m not saying that I got invited to attend these conferences because of my relationship with my peer advisor alone (although his influence definitely couldn’t have hurt). I think what really separated me from the other interns, and led to my invitation to the conferences, was the fact that I took action on my peer advisor’s advice. It was my ability to execute the advice that left an impression and demonstrated levels of understanding, confidence, and productivity beyond those of the other interns. Now, I realize that you won’t usually be assigned a mentor like I was in my internship, but you can find mentors everywhere. If there’s someone that you want to learn from, just reach out to him or her. For example, the other day, I came across a great article by entrepreneur Max Ogles, so I decided to shoot him an email. Here’s the email I sent him. I didn’t expect him to respond, especially after a few days of not hearing back, but then he did. And he gave me some really great advice. In the past, I didn’t ask for feedback frequently enough. But, ever since he gave me this advice, I started making a conscious effort to ask for more feedback. Then, a couple months later I followed up with him to let him know how his advice had benefited me. He was very excited and glad to hear that I had implemented his advice and benefited from it. That’s really all it takes. As long as you’re not asking for too much and are respectful of their time, people are usually more than happy to help. 1. Find someone who you would like to mentor you. Your best bet is to look for mentors who are one or two levels above you in whatever skill you’re trying to improve. They can give you all the advice you need to get to the next level, and they’ll likely be more than willing to help you since they were just in your shoes not too long ago. 2. Ask them for their advice. Look for any advice you can find from these people that’s already publicly available. Read their books, blogs, social media profiles, etc. Then, ask them one—just one—very specific question (whether it’s in person or via email, it doesn’t matter). This is what will separate you from everyone else—you take action, they don’t. There’s no point in asking for someone’s advice if you’re not going to act on it. Not much else to say about this. Just do it. The follow-up is crucial. If you don’t follow up with them on your results, they won’t know that you actually took their advice to heart. Tell them how their advice has benefitted you, and thank them for giving it to you. If you do this, your mentor will know that you take your improvement seriously and he’ll be happy to keep the relationship going. I won’t spend too much time here talking about how to prepare for career fairs, because Thomas has already done a very good job of that. I especially like his advice about practicing talking to companies that you don’t care about first (again, practicing when the stakes are low). What I want to focus on is two mindset shifts that will completely change the way you view career fairs and help you get more out of them. 1. Realize that it’s is a two way street, and you’re driving bumper cars. Most people think that they are there to impress the recruiters, but really it’s a two way street. Reminding yourself that companies are there to impress you as well should help you relax. You also have to remember that this is just a career fair, and the point of a career fair is to practice your networking skills in a safe (low stakes) environment. If you screw up and say something stupid, there are minimal repercussions. You might not get the the job offer (you’ll get over it), but you haven’t really lost anything per se (to lose something requires that you had something in the first place). On the other hand, if you screw up and say something stupid in the “real world,” you can lose your job. As a student, it’s important that you start learning how to improve your networking skills, because once you’re a professional, you can’t afford to make stupid mistakes. The stakes are much higher. So, do your homework before hand, but don’t feel like a single career fair is going to define your life destiny. It’s okay if you screw up. You have nothing to lose, and you’re better off crashing now, rather than later. Imagine for a second that you are a recruiter and you meet two students. The first student has a 4.0 GPA, and the second student has a 3.4 GPA. You talk to each student for three minutes. The first student bores you to death (and looks like he doesn’t want to talk to you, because he seems bored to death too). The second student talks to you about an app that he built for fun and his excitement is nearly palpable. Which student do you think would leave a better impression? The answer is obviously the second student. When you’re at a career fair, you’ll be competing for jobs with other people who might look better than you on paper. But, it doesn’t matter what you look like on paper when you’re talking to someone in person. Instead of trying to show recruiters how great you are, focus on showing them how you’re different (in a positive way, obviously). When introducing yourself to recruiters, tell them your name, major, and all that other good stuff, but also be sure to talk about what makes you unique. For me, when I was applying to consulting companies, it was easy. It was the fact that I was an engineering student (most of the students applying for the position I was applying for were business majors), and, I ran a blog on the side. Some people might argue that this information is irrelevant, but I used it as a way to differentiate myself. Every time I walked away from a recruiter, I knew that they would remember me as the engineering student who has a blog. It was also always one of my major talking points in interviews and I’m positive that it helped me get my first full-time internship the summer after my junior year. It showed that I was motivated enough to learn and do things on my own, outside of the classroom. My final tip here is that when you talk to recruiters about whatever it is that makes you unique, be proud of it. If you’re not excited to talk about it, why would it make anyone else excited to hear about it? The last thing you want to do is bore a recruiter. Elevator pitch [noun]: a short summary used to quickly and simply define a person, product, service, organization, or event and its value proposition. The name comes from the idea that it should be possible to deliver the pitch in the time span of an elevator ride, or approximately thirty seconds to two minutes (I’d say aim for 30 seconds). Technically an elevator pitch can be about anything (product, service, organization, etc. ), but today I’ll be focusing on the personal elevator pitch, which is the pitch you use to sell yourself at things like career fairs. If you’re at a career fair, your goal should be to interest the recruiter in learning more about you, not to tell your whole life story. 2. Explain what you do. I’m sure you all do lots of things, but here you want to focus on what you do that’s relevant to your listener. Explain who you are and what you do or what you study. 3. Communicate your USP (unique selling proposition). What makes you unique from every other student? Highlight any skills or experiences you have that most others don’t. 4. Engage the listener with a question. End your pitch with a question in order to engage the listener into the conversation. Otherwise you’ll end your pitch and there will be silence, and it will be awkward. “(2) Hi, my name is Stefano. I’m a senior studying industrial and systems engineering with an emphasis in information systems. (3) Because of my engineering background, I enjoy solving problems in the most efficient and practical way possible, but I really want to be a consultant in the IT industry because I think it’ super exciting how technology is transforming the world we live in and the way that businesses operate. If you’re a student, one of the best ways to network is by joining student organizations on campus. I recommend getting involved in one or two organizations that you are genuinely interested in, becoming an active member, and eventually, a leader in the organization. By taking a leadership role in a student organization, not only will you start to build a strong network with motivated individuals who are interested in the same things as you (and who may help you land a great job), but you’ll also gain tons of valuable experience to put on your resume (which will help you land a great job). Join a student organization, or two (be careful about joining too many, because you’ll start to stretch yourself too thin). Be involved, help out in any way you can, and build relationships with other members of the org. Become a leader of the organization. Of course, you can always be involved in an organization without joining the leadership team and still make great connections. But, I really, really encourage you to try to become a leader. It will make you so much better at working with others. While there are many characteristics that define a great leader, one of the most important ones is your ability to connect with people (i.e. network). Some other great places to network are in class, at work, at conferences, on retreats, at workshops, at volunteer events, online using your personal website and social media networks (connect with me on Twitter! ), at parties, at bars… literally, anywhere. The only reason why I say that student organizations are one of the best places to network is because they consist of a smaller, filtered group of people that you already know have interests similar to your own. But, networking doesn’t require you to find people who are exactly like you. I’ve noticed that, more often than not, I can find at least one thing in common with anyone that I meet. And that’s all you need to build a relationship with someone. When I was a freshman, I got my very first job at USC’s calling center. My job was to call parents and alumni and ask for donations (yeah, I was one of those people…). One of my first Instagram selfies. Taken at USC’s calling center. It wasn’t an easy job, but I’m happy I did it because it drastically improved my communication skills, and it also led to my first summer internship. It happened about two weeks before the semester ended. I remember I was having a rough day at work, and I couldn’t wait for my shift to be over. About 10 minutes before my shift was over, I was on the phone with a USC alum who graduated in 2010 and found out that he was from the same hometown as me. Boom. Instant connection. We ended up having a great conversation and talked about a bunch of stuff that I don’t remember. All I remember is that at the very end, he told me that he recently started a company and was looking for interns, and that I might be a good fit. Long story short, he didn’t donate any money—but, three weeks later, I started working for him. I was the company’s first intern, he became one of my first mentors, and I learned a ton that summer. Wherever you go, make an effort to meet new people and find out what their stories are. It’s okay if you just end up making some small talk and it doesn’t lead to anything. If that happens, what’ve you lost? Nothing. But, you’ll never know what you missed out on unless you start putting yourself out there. Professors are invaluable resources that few students take full advantage of. Aside from the obvious benefits of building a positive relationship with your professor (if you think human bias doesn’t affect their grading, think again), networking with your professors also has other benefits. For example, during my junior year I took a class on database systems which, to this day, was one of my favorite classes at USC. Not only was the material interesting to me, but the professor was also brilliant. So, during our final class project, when we had to design, build, and implement an entire database system for a real company, I would go to my professor’s office hours at least once a week. I did this because a) I needed help on the project and wanted to get an A in the class, and b) I wanted to build a relationship with him. When the semester ended, two things happened. The was that I got an A on the project and in the class. The second was that, two months later, I got an email from my Professor in which he recommended me to the hiring manager of USC’s Information Services department for a part-time position. I ended up not taking the position because I already had a part-time job, but it was a great opportunity nonetheless, and a prime example of what a good relationship with your professor can lead to. So, how can you build relationships with your professors just like I did? 1. Go to their office hours. At least once. Even if you don’t have any questions or concerns, find a reason to go. The point is for your professor to know who you are and be able to put a face to your name. Few students ever go to office hours, so simply showing up once puts you in a better position than most of your peers. If anything is ever unclear in class, raise your hand and ask your professor to clarify. Not only will it clear up your confusion, but it will also show the professor that you’re actually paying attention. Plus, it’s their job. You might even want to make a point of raising your hand and asking at least one question every class. 3. Read their blogs or websites. Most professors host their own sites. Follow the links to their publications and read their work if you want to get a true sense of their intellect. Then, impress them by sharing your thoughts on a recent paper they wrote. Great professors love great dialogue. 4. Share relevant outside material with them. If you ever come across something that reminds you of the material you’re learning in the class, share it with your professor. It shows that you’re making your own connections and thinking about the material outside of the class. This will not only make your professor very happy, but will also help you learn and remember the material better. 5. Invite them to events. For example, my fraternity held a “scholarship dinner” every semester which allowed us to invite our professors to a semi-formal dinner and get to know them on a more personal level. It sounds kind of awkward, but they loved it. If you don’t have the opportunity to do something like that, instead opt for inviting your professors to be guest speakers at events for the student organizations that you’re in. Even if they can’t attend for whatever reason, they’ll be happy that you thought of them. If you’ve ever found it difficult to stay in touch with the people you meet, or to remember where you met someone or what you last talked about, this system is exactly what you need. I’ll show you how to set it up in a second, but first I need to tell you something: the key to finding value in networking is to focus on the process, not the results. You can’t expect to become an expert networker overnight. Even though I’ve improved my networking skills a lot over the last few years, I still make mistakes all the time. But, mistake by mistake, I get better and better, and I know that as long as I continue to improve just a little bit every day, one year from now I will be so much better. It’s a long process that takes time, but if I can do it, so can you! Fortunately, there are systems you can set up (systems that I use) to make the process easier. If you set this system up properly, and you actually use it, I promise you will get the results you want. Note: While you can set this up system using normal documents and spreadsheets in Microsoft Word/Excel, I recommend using Google Drive. Step 1. Go to Google Drive and create a new folder. Name it “Relationships”. Step 3. Save the “Relationship Database” spreadsheet as a bookmark on your Bookmarks Bar for easy access. Now that you’ve created a database to keep all of your contacts in one place, we are going to create individual documents for each of your contacts and link them to the database. These documents will be used for recording additional notes about your contacts (their hobbies/interests, conversations you’ve had with them, etc.). Step 5. Copy and paste the document link into the “Contact Info Doc” column of the “Relationship Database.” This way you can easily access the Contact Info Doc from your Relationship Database. Step 5. Repeat Steps 4 & 5 for all of your contacts. Now that you have a database to keep track of everyone in your network, we’re going to go ahead and schedule time for you to stay in touch with them. Step 2. Add a link to this guide in the description. Also add a link to your Relationship Database. Step 3. During that time each week, take 30 minutes to add value, or at least connect with, at least one person in your network. This might mean introducing two people to each other, taking someone out for lunch, scheduling a call, or simply reaching out to someone you haven’t talked to in a while. You can use this guide for some specific ideas on what to do and your Relationship Database for ideas on who to contact (that’s why you should have both in the description for easy access). Whenever you meet someone new that you want to build a relationship with, create a new Contact Info Doc with his name, add his name to the Relationship Database spreadsheet and paste a link to his document. Any time after you have a conversation with someone in your Relationship Database (whether it’s in person or on the phone or via email), open his Contact Info Doc and record anything you can remember from your conversation with him. Any time before you’re going to meet with someone in your Relationship Database, you can check the notes from the last meeting and follow up on what you talked about. People love this because they see that you actually paid attention to what they were talking about. …and prevent this guide from being just another thing that you read but never put into practice. This is a long guide. If you actually read the whole thing, kudos. Unfortunately, just reading this guide isn’t enough. If you don’t start taking action, then you’ve just wasted your time. But, if you’ve read this far, I have a feeling that you actually want to open up new doors of opportunities–not just read about them. I know that it can be extremely difficult and overwhelming to put a guide like this into action… that’s why I’ve put together a BONUS “Cheat Sheet” that will help you overcome the barriers (like “I don’t know where to start”) that might otherwise prevent you from taking action. This cheat sheet is a shorter, action-oriented PDF version of this guide that I’m offering for FREE, exclusively for College Info Geek readers. 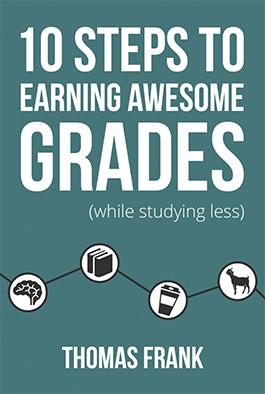 To download the Cheat Sheet and start putting this guide into action right now, click here. A T-shaped person has a broad base of general skills and knowledge that support deep knowledge in one area. Learn how you can apply this idea to your life.